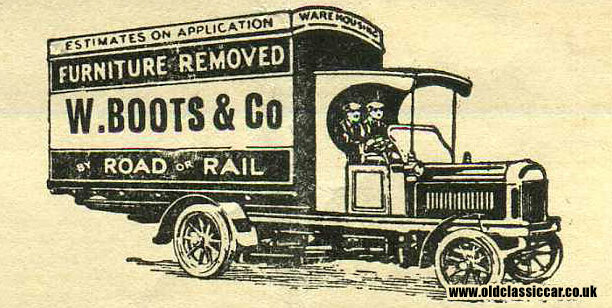 W. Boots & Co. Carriers and Removals 1923. Homepage. This page: An invoice for parcel deliveries, illustrated with a vintage furniture removals lorry. W. Boots & Co. advertised themselves as "Railways Carriers and Naval Baggage Agents", and evidently had quite a large business running in the 1920s. In addition to premises on Swan Street in Portsmouth, they also had an operation at Railway Street in Chatham. The Chatham addresses now seen to be occupied by a hair salon and a pub. 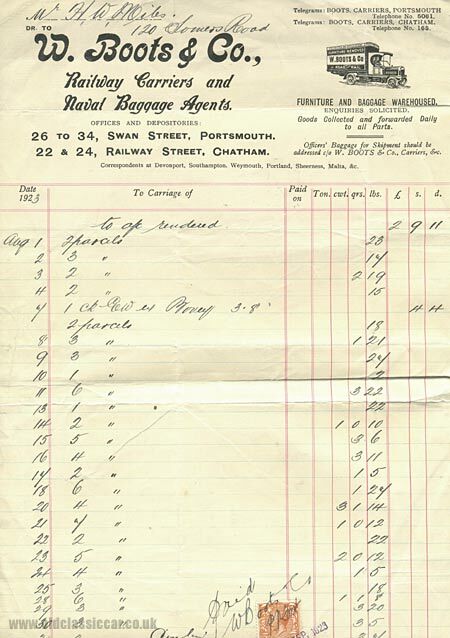 In addition to deliveries by lorry, they also offered warehousing and a furniture removals service, presumably using the vintage lorry portrayed on the top right of the invoice. Does anyone recognise the model of lorry shown - perhaps a Thorneycroft? This particular invoice refers to the delivery of parcels on most days throughout August 1923, for a Mr H W Miles, of 120 Somers Road, which I think is in Reigate. In 1926, Mr Miles re-located from Somers Rd to a new address on Victoria Road, and the move was undertaken by George Park & Co. Ltd who operated steam lorries from Southsea. Shown below is a clearer look at the vintage lorry illustration. More motor-trade related invoices can be found in this Motoring Collectables section of the oldclassiccar site.